Oregon summers are beautiful. Perhaps it's the welcomed warm temps and the abundance of fresh fruits and veggies produced by the Willamette valley, or maybe it's just the fact that the state's residents have been waiting out an abnormally long rainy season to finally get a glimpse of the sun. Sunshine is a powerful thing. Almost powerful enough to make you forget about the last 9-10 months of dreary gloom. Almost. One of the many favorite activities of the seasoned Oregonian is picking blackberries. The bushes grow wild, and I do mean wild, as in everywhere you go around town, you can usually spot berry pickers, usually along the side of the road, with purple-stained fingers and vessels of all sorts to hold their loot. 1. In a food processor, blend together the flour, 2 Tbsp. sugar, and salt. 3. Add the ice water (not the ice) and pulse until the dough starts to clump together. Add more water as necessary to come together, but not enough to make the dough wet and sticky. 4. Knead the ball of dough on a floured surface for a minute, cut in two, and wrap each ball in plastic wrap and pop into freezer for about 10 minutes. 5. Toss together the berries, 2/3 cup sugar, and cornstarch. Set aside. 6. After the dough has firmed up a bit, take one ball of dough and roll out (on parchment paper) to a rectangle about 7 inches high by 15 inches wide. Dough will be very thin. Cut into 5 equal vertical strips, about 3 inches wide. 7. Spoon about 1-2 Tbsp. of the berries onto the lower half of the strip. Brush the edges with egg wash (one egg beaten well) and fold over the top half of the dough to make a square pocket. It will look like a jumbo ravioli. Press together the edges well, then use a fork to crimp the edges. Cut an X in the top of the pie and transfer to a parchment lined baking sheet. Keep making the pies until all the dough is used (including the second dough ball still in the freezer). 8. 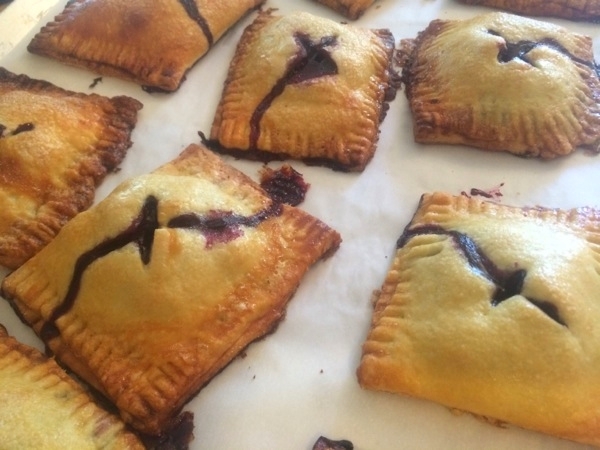 Pop the tray of hand pies into the freezer for about 30-45 min. Don't skip this step! While the pies are freezing, preheat the oven to 375 degrees. 9. Brush the pies with the rest of the egg wash and sprinkle with plenty of granulated sugar. 10. Bake at 375 for about 35 minutes, or until golden brown. Let cool on a wire rack and serve warm or at room temp.